These Oven-Baked Sweet Potato Wedges are crispy on the outside, tender on the inside, and dipped in an herby garlic yogurt sauce. Autumn is calling, and these spiced wedges are answering. 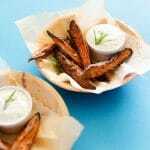 Wash sweet potatoes, then cut into wedges (cut in half, then cut each half into 4 pieces, lengthwise). Places wedges in a large bowl of cold water and set in the fridge for 30 minutes to an hour (or longer if you’ve got places to be). Remove wedges from water and pat dry. Add 1 Tbsp of cornstarch to a plastic bag and toss in the sweet potatoes. Blow some air into the bag and shake shake shake. Potatoes should be lightly, evenly coated in cornstarch (add more cornstarch as necessary). Add paprika and cinnamon and shake again until evenly coated. Lay potatoes on a parchment paper-lined baking sheet and drizzle with oil. Toss the potatoes around to evenly coat each with oil, then arrange fries skin-side down so that none are touching and each has plenty of room to let out moisture (you may need to use 2 pans). Trim just the top off of your head of garlic and remove any papery pieces that are loose. Drizzle olive oil over garlic so that it sinks into the exposed cloves, then wrap in aluminum foil. Cook sweet potato wedges and garlic at 425 degrees F (232 C) for 40 minutes, or until fries are crispy and lightly browned. Rotate pans halfway through the cooking process if using 2 pans. Turn off oven and slightly prop open the door. Allow fries to crisp for 15 more minutes. While fries crisp up, combine 5 cloves of the roast garlic, yogurt, rosemary, salt, and pepper. Remove fries, sprinkle with salt, and serve with yogurt sauce. *You’ll want to use a low smoke point oil, like grapeseed, canola, or peanut. With this high temperature and long cooking time, olive oil will get very smoky. Recipe from Live Eat Learn at https://www.liveeatlearn.com/oven-baked-sweet-potato-wedges/.